In last week’s post I introduced readers to a concept called a “visual vocabulary”. In this installment of this series on developing a psychology-related visual vocabulary, I will be showing you how I doodle one of the staples of my psychology visual vocabulary: a mother and child. Mother and child, or parent and child, relationships are a common topic in psychology classes – especially in my graduate program where significant emphasis is placed on early attachment models between an infant and their caregiver. For a long time, this was an intimidating visual for me – people and faces are difficult to draw, and every time I tried to draw an infant it ended up looking a little bit like a pig in a blanket! Like most things, with intentional practice on getting better at drawing bodies, faces, and infants, I slowly began to develop the ability to quickly doodle a parent-child pair. It definitely helped encourage the process of learning when I had the opportunity to take a graphic recording gig at the Bill and Melinda Gates Foundation. 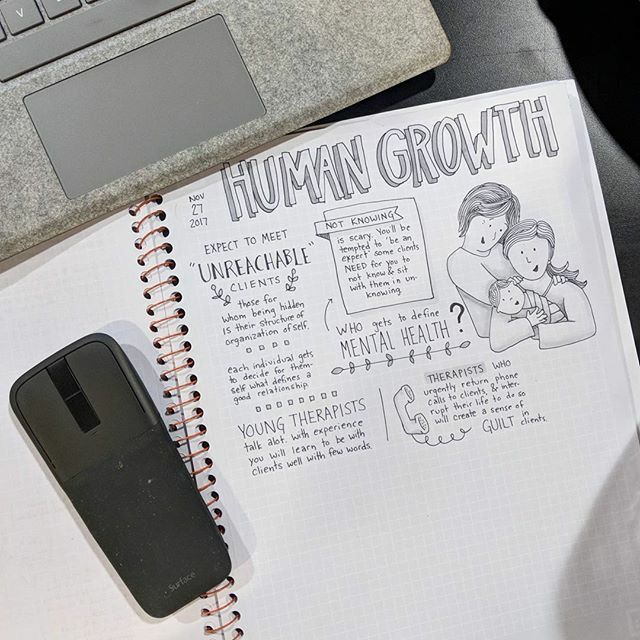 Prepping to graphic record during a meeting on global child health was a fantastic impetus concretizing my budding ability to doodle a mother holding a baby to her chest, and other child health-related images. I want to be very intentional about showing you my learning process here. The image above is a shot of this pair as I was growing a little bit more confident about actually putting it into notes. Remember that it doesn’t have to look great the first time you doodle this – it doesn’t even have to look good the 30th time – it’s all about practicing and being willing to learn and being willing to bless the process of learning. In this post, I’m going to walk you through how I draw a mother and baby step-by-step. I start with what is the hardest part for me: Using pencil, I sketch a circle for the baby’s head, and the curve above and just to the side of the circle for the mother’s face. In this first step I go ahead and include facial features, because it is important (and sometimes takes a bit of sketching and erasing) to create facial expressions and placement that creates the appearance of mother and baby looking at each other. finally, with the addition of a few lines to represent a lumpy baby blanket and a hemline to the mother’s shirt, your doodled bust of a mother and child is nearly complete. I often get carried away detailing hair at this point, but you can leave it plain to fill in with color or add texture and depth by adding lines. Now a part of my visual vocabulary, I can sketch this mother and child pair into my notes in just a moment. Often, during the course of taking sketch notes, I will block out this figure and continue on taking notes – returning to add detail and color when the speaker stops to tell a story or answer questions. A little bit of shading goes a long way, so I almost always go back over my doodles with an N0 Copic marker to add depth to my cute little mother and child pair.